WARNING: SPOILER AHEAD. IF YOU HAVEN'T READ IT YET, MAKE SURE YOU DO BEFORE READING THIS REVIEW. YOU MIGHT KILL ME. SOMEHOW. "And here we are, in the middle surrounded by a sea of stars. Any of them could hold a planet. Any of them could hold a home. But all of them are out of reach." My Rating: Honestly, it took me quite a while before I got to reach the second book for the trilogy. It was back in 2011, I think. Mainly because I didn't have my iPad then and I haven't really been introduced into the World of Kindle which is such a pure disdain. Sigh. So, there were times when I literally forgot some terms that had been used, like Frex and Phydus (which is probably the most important element in the story that I so carelessly forgot). But whatever. I didn't care about anything, just that it's a book and I fell in love with the first one. The Cover: It would do. Nothing much to say here since I wasn't that merrily impressed by it or that horrified by its existence. But I love the galaxy pinch to it though. 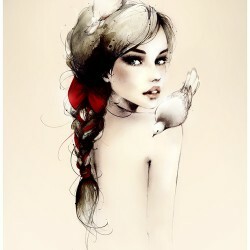 It reminds me of Tumblr and all its epic glory-ness. Oh well. Moving on. Overall Plot: To sum things up, a lot of ruckus had been going on and on in circles in my head and I've been sitting pointlessly, staring at the ceiling right after I finished the last chapter, practically losing my breath. And suddenly, the magical realms of my bedroom ceiling looked appealing. I was unable to write a coherent review for this one. Apparently, a lot of stuff happened. And I have no idea where to start. Sometimes it gets really-amazing-OMG-I-can't-stop but the consistency of its grandiloquent emprise gets frustrating at times that I get to have these bush-league sessions wherein I indulge myself in lubber pleasure (translation: I don't like the mean guys, at all). So, when the bad people came out to show off their pleasantries, I have to gradually drag myself over the pages. It was a begrudging journey, nonetheless. 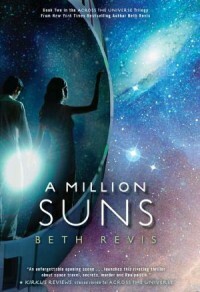 A Million Suns (or Across the Universe, for that matter) is a kind of book that doesn't converge in the melancholy and serendipity of love affairs. IF YOU'RE LOOKING FOR A SCI-FI/YOUNG ADULT LOVE SHITS, IT AIN'T HERE. BETTER SAVE YOURSELF THAN SORRY. IT DOES, HOWEVER, DEPICTS A JOURNEY THAT GETS YOUR THIGH-HIGH BOOTS KNOCKED UP ABOVE THE NOTCH. The love story that happened here wasn't one of those kiss-deprived characters (which I undeniably like) that usually flaunts about in a certain story (okay, in most stories) but it contained itself shut in a tiny container, only letting out tidbits of fluffy moments. Although it did have some weak points from time to time, the vast expense it travelled, taking the time knowing each other better, and the expostulation they both had to unravel and decipher was not only a piece of an ice cake perfection but rather that tiny cherry on top -- which, in other words, convey undisputed love that would remain true and intact forever. However, as I humored myself deeper into the plot, I thought that it was a bit tad predictable to know Doc was doing inexplicable. Probably among the lines of enigmatic chastism and retribution. There was no surprise there for me. In Across the Universe, he already proved his worth and how unlikely he was to be trusted above all other things. Which by the way looks like someone who just got chased by ducks. That was how the story got me. Especially when it got really intense and I got the kick for the thrill it offered. I really fancied the idea of each clue that Orion gave and that Amy and Elder had to run off and seek out answers. And now that they finally discovered that they were just orbiting around Centauri-Earth made me lose (just a bit) my edge. I HAVEN'T BEEN THIS FREAKIN' EXCITED FOR A BOOK ALL MY LIFE! Excuse me while I *sniff* *sniff* grab a box of tissue. Characters: I appreciated how the characters were strong but at the same time weak and that they needed dependence. What I liked the most about them was that they weren't superfluously described in between chapters. They weren't called as hot or God-like or heavenly. They weren't called for perfection. They were flawed, they created mistakes and they weren't proficient. I was satisfied enough knowing what her hair color was like, how red it was or how it shined against the solar lamps, what Elder looked like, not bothering to overlook those layers of space clothes just to know if he had a six-pack. The idea alone that the two characters instantly clicked right at the beginning was a great remnant of what a real story was about. On the Alternating POVs: I don't usually like these kind of chapters as to how easily I get confused when the characters started talking. Like say, for example, the Allegiant book by Veronica Roth. (But I'm not about to compare the two as I hate discriminating another piece of work). Although this book wasn't near to accuracy (since I still get confused between POVs), the dangling perfection is there. Who needs a perfect book anyway? Just as long as you sit there, begin reading and see how it all unravels, you witness the energy it gives off, judging by its cover alone. If I like it, I stay completely glued. If I don't, I close it. I shalt thou proclaim my peace and move on with the last book.